Scene From Gracioso and Percinet, at the Haymarket Theatre. Mr. Planché, the originator of the elegant school of burlesque, which has since become so popular, and to whom we are indebted for such pleasant reminiscences of "Fortunio," "The Fair One with the Golden Locks," and all the costly extravaganzas during the Vestris dynasty at Covent Garden, has again drawn from the graceful stories of the Countess d'Anois and produced a new dramatic nursery tale entitled "Gracioso and Percinet." At the commencement, we have Mr. James Bland, the king of burlesque potentates, as King Uxorious, a widower unexpectedly bewitched, who, in consequence of his ceaseless weeping over the decease of his first wife, is recommended to go a hunting for another, under the care of his chief huntsman, Lord Nimroddy (Mr. Caulfield). 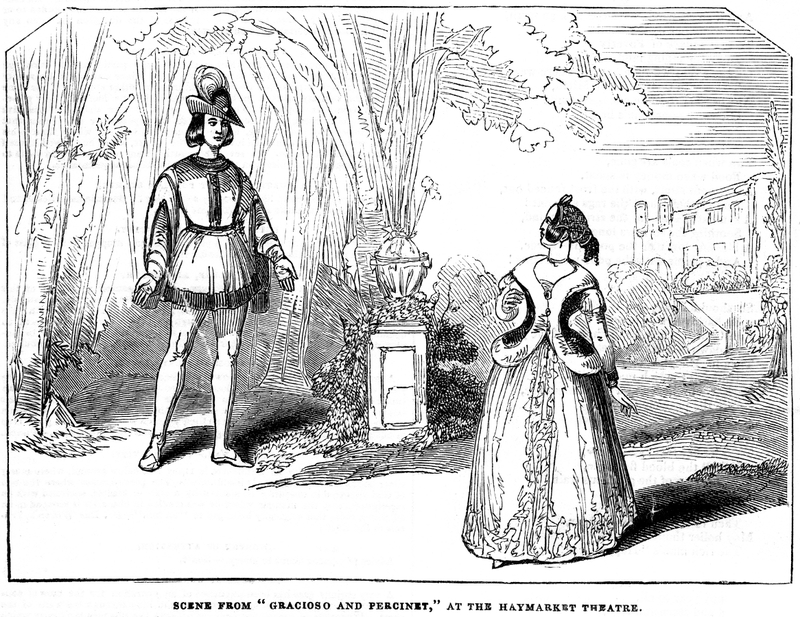 In pursuing the sport, himself and train arrive at a castle, inhabited by a wicked fairy, disguised as the Duchess Grognon (Mrs. Stanley). The duchess has a capital cellar and at last prevails upon the King, who is somewhat of a grasping disposition, to marry her. On her arriving at the palace, she finds the King's daughter, Gracioso (Miss Julia Bennett), so beautiful and so popular, that she immediately conceives a violent hatred for her, and imposes a variety of strange tasks upon her, which it seems impossible that she can accomplish. Percinet, however, "a fairy prince, and the perfection of lovers," comes to her assistance, and aids her in getting through her labours; and in the end, the pair are both made happy. The dialogue is smart and abounds with happy turns and allusions, and the mise-en-scene is unexceptionable, not perhaps presented with the brilliant effect which distinguished that of "The Fair One with the Golden Locks," and one or two others of the Christmas fairy productions of the same author, but still excellent and complete in its way. Several favourite arias, among them-- "When other lips," from the "Bohemian Girl," were introduced, and those sung by Miss Horton drew forth repeated applause. The whole piece passed off most successfully, the curtain having fallen amidst enthusiastic plaudits.